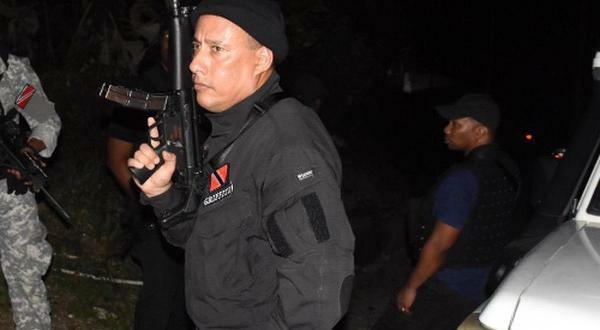 Not for the first time this year, the Trinidad and Tobago Prison Service had some civilian help in thwarting a brazen attempted escape from its facility. 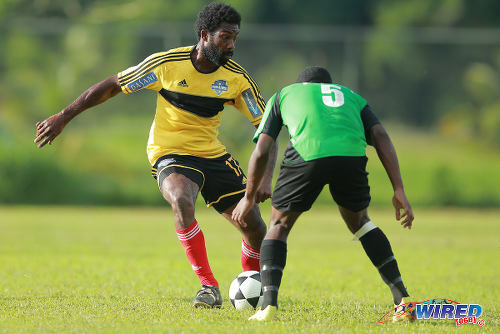 On this occasion, the action happened on the football field as the CNG National Super League’s Championship Division kicked off at five venues across Trinidad. 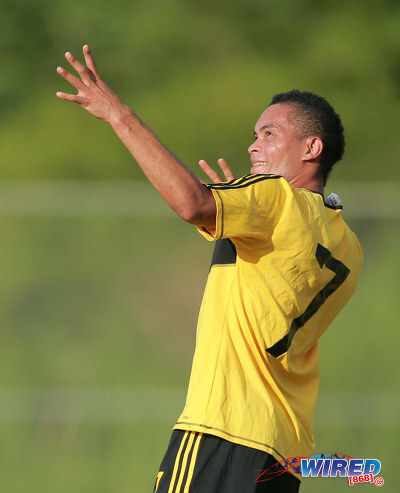 Photo: Cunupia attacker Eduardo Guedes celebrates his strike against Prisons FC in Championship Division action of the CNG Super League at the Youth Training Facility, Arouca. 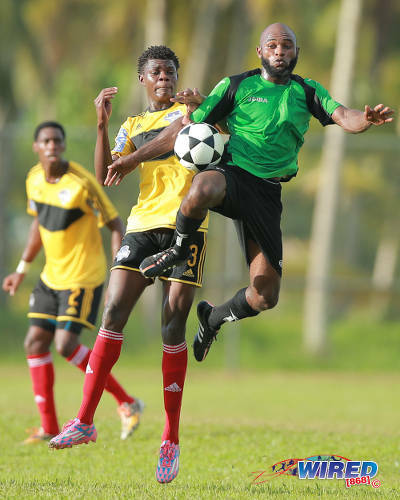 Cunupia FC looked to have three points sewn up and, figuratively, were almost out the gate when Prisons’ civilian striker Curtis Carrington stopped them dead in their tracks with a late strike. 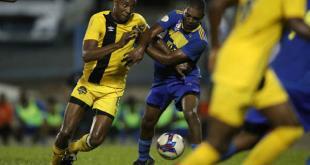 It was a fair start to life in what is effectively the third tier of football in Trinidad and Tobago. Both teams used 4-2-3-1 formations and the match was competitive and hard-fought. 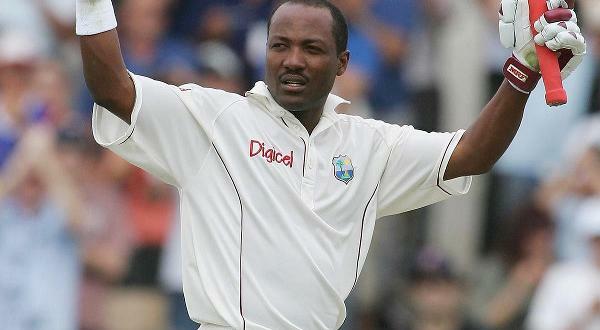 But, for roughly half the fixture, it looked like the “Cunupia Predators” had done just enough. Eduardo Guedes, one of two Brazilians in the Cunupia line-up, produced a clinical finish in the 43rd minute and, apart from the odd set piece, Prisons rarely looked capable of getting back into the match. 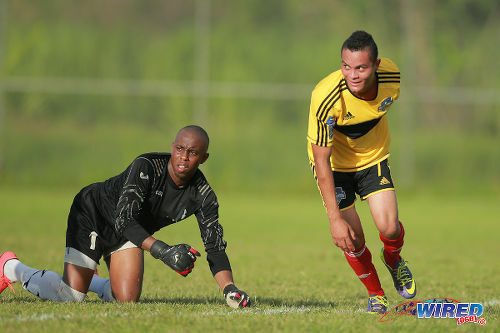 Photo: Cunupia FC attacker Eduardo Guedes (right) wheels away to celebrate while Prisons goalkeeper Jevon Bourne in CNG Super League Championship Division action at the Youth Training Facility, Arouca. In fact, the Prisons outfit—which consisted mainly of Prison officials along with five civilians, including Carrington—was lucky not to fall further behind. 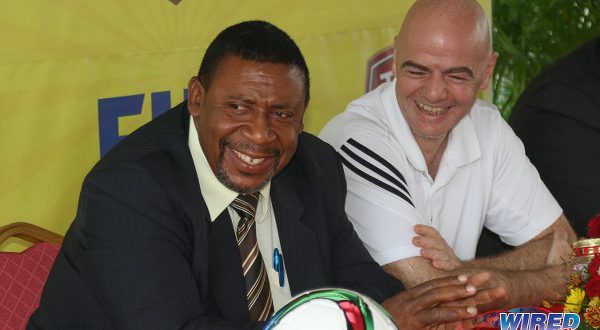 As the hosts huffed and puffed but ultimately petered out, midway in the opposing half, Cunupia striker Steve Stoute terrorised them on the break but, somehow, could not deliver the insurance item. There was a decent Stoute penalty appeal that referee Rashby McPhie ignored, as well as a clever lob that cleared the bar and two other shooting opportunities he could not take. His teammates deserved better for all their resistance and service. There were close to three dozen YTC inmates looking on from the southern end of the ground. God knows who they were supporting. Photo: Cunupia FC defender Raymond Alleyne (left) passes the ball under pressure from Prisons FC attacker John Stewart in CNG Super League Championship Division action at the Youth Training Facility, Arouca. Likewise the lush green grass and backdrop of gorgeous trees contrasted with the bumpy, treacherous surface that tested the players’ technique and concentration. Things are not quite as they seem at the YTC ground. There were only five minutes left in regulation time when Prisons managed an unlikely equaliser. 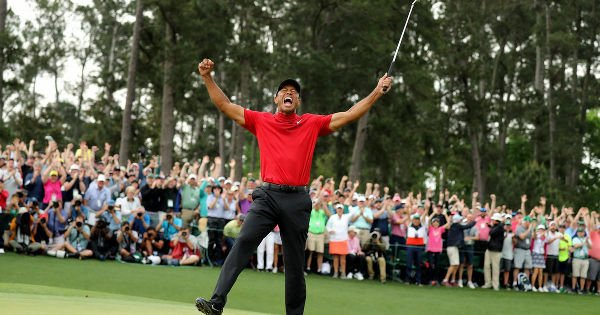 And it was the kind of goal that makes a coach have sleepless nights. Cunupia defender Dale Simon, a former top flight player with Fire Services, tried to run across the top of his own penalty area with the ball rather than belt it clear. And Carrington spotted the opportunity and lunged in to lash the ball off his foot and past surprised Cunupia goalkeeper Kevin Graham. 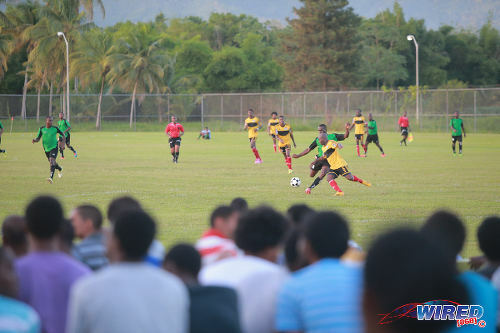 Photo: Prisons FC striker Curtis Carrington (centre) drives the ball past Cunupia defender Dale Simon for a late equaliser at the Youth Training Facility, Arouca. 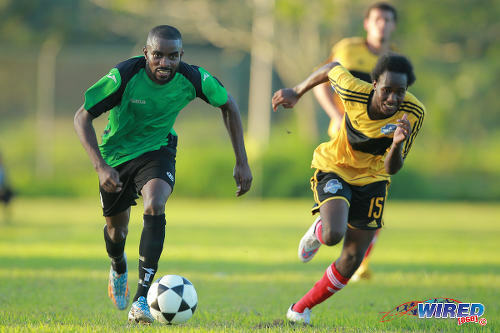 Cunupia would hope for a better result next Tuesday when the Predators face Xtra Foods Chaguanas FC at the Edinburgh 500 Recreation Ground in Chaguanas. 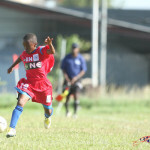 Prisons are at home again next week as they welcome Petit Valley United. And Petit Valley should be warned that the YTC ground is not as easy to escape from as it might seem. 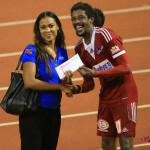 Prisons FC (4-2-3-1): 1.Jevon Bourne (GK); 6.Irwin Cayenne, 3.Keston Pierre, 4.Terrence Gene, 5.Sean Diaz; 12.Gabriel Gour, 17.Questelle Walters (19.Randy Primus); 8.Ricardo Alleyne, 9.Stephen Julien, 20.John Stewart; 10.Curtis Carrington. Unused substitutes: 2.Sheldon Clarke, 11.Cleve Moore, 16.Lance Haynes, 24.Shaun Checkley, 25.Ricardo Wade. Cunupia FC (4-2-3-1): 13.Kevin Graham; 12.Jamal Spencer, 2.Raymond Alleyne, 6.Dale Simon, 15.Kyle Mack (9.Omari Lezama); 3.Duayne Baptiste, 11.Lester Joseph; 7.Eduardo Guedes, 14.N’kosi McQueen (8.Dillon Walker), 16.Owayran Osman; 5.Askhay Sooknanan (17.Steven Stoute). Photo: Prisons FC attacker Stephen Julien (right) tries to protect the ball from Cunupia FC midfielder Duayne Baptiste in CNG Super League action at the Youth Training Facility, Arouca. Petit Valley Utd 2 (Michael Ramsey 11, Kamaro Samuel 14), UTT 2 (Nyron Jones 70, Ricardo Castellano 82), Northern Rec Ground, Diego Martin, 8 pm. 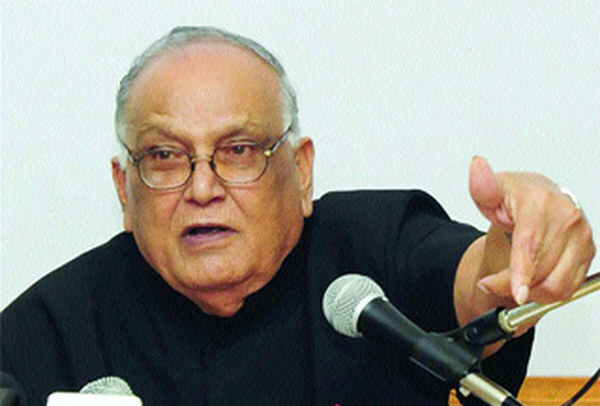 *–Did not play due to no-show of match officials. 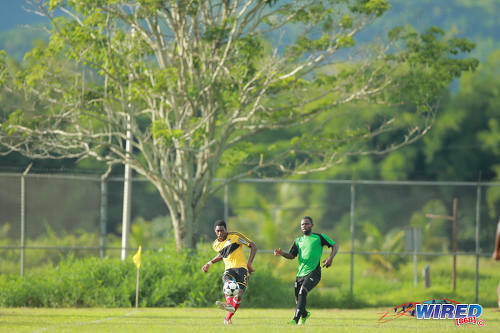 Photo: Cunupia FC striker Steve Stoute (left) takes on Prisons FC defender Sean Diaz during CNG National Super League Championship Division action at the Youth Training Facility, Arouca. 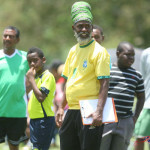 Bethel Utd v WASA FC, Montgomery Rec Ground, 5 pm. Defence Force FC on a bye. Photo: Prisons FC winger Ricardo Alleyne (left) takes on Cunupia FC defender Kyle Mack during CNG National Super League Championship Division action at the Youth Training Facility, Arouca. Malabar FC v Edinburgh 500, D’Abadie Recreation Ground, 7 pm. Fraid to make a comment.But what jail is this ?